Looking at that blood red, makes me think this would've been a great cocktail for Halloween weekend. Oh well, it'll have to wait till next year! For this, you will need, vodka, I recommend a citrus one but regular will do, and go ahead with your bad self and bring on the Grey Goose or Finlandia, if you like. Me, I'm on a budget. 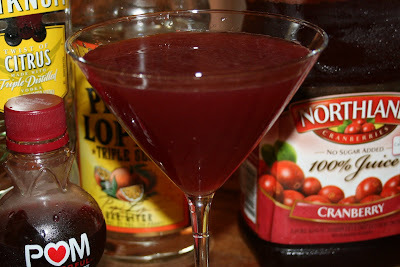 You'll also need, triple sec, pomegranate juice, cranberry juice (or you can double up on the POM), and one lime. You'll also need a shaker. You remember my fancy smancy one, right? Pour everything in your shaker, top it off with some ice, give it a little shake and strain into a chilled martini glass. I actually like a bit of sweet with mine (surprise, surprise) , so I prefer the Rose's over the fresh lime juice here to add a bit of sweet. Swirl ice cubes in both martini glasses to chill; discard the ice. Add all of the ingredients (except garnish) to a shaker, top with ice. Shake until thoroughly blended and strain into two martini glasses. Love the red color and I can say that i've made a few of these myself and they are wonderful!